Postoperative visual loss (POVL) is a potentially devastating complication of lumbar spine surgery that may lead to significant functional impairment. Although POVL is rare, a review of the literature shows that it is being reported with increasing frequency. A systematic analysis detailing the etiology and prognosis of the 3 main types of POVL has yet to be published. We reviewed potential preoperative and intraoperative risk factors for ischemic optic neuropathy (ION), central retinal artery occlusion (CRAO), and cortical blindness (CB) after lumbar spine surgery. A PubMed and Google literature search was completed in the absence of time constraints. 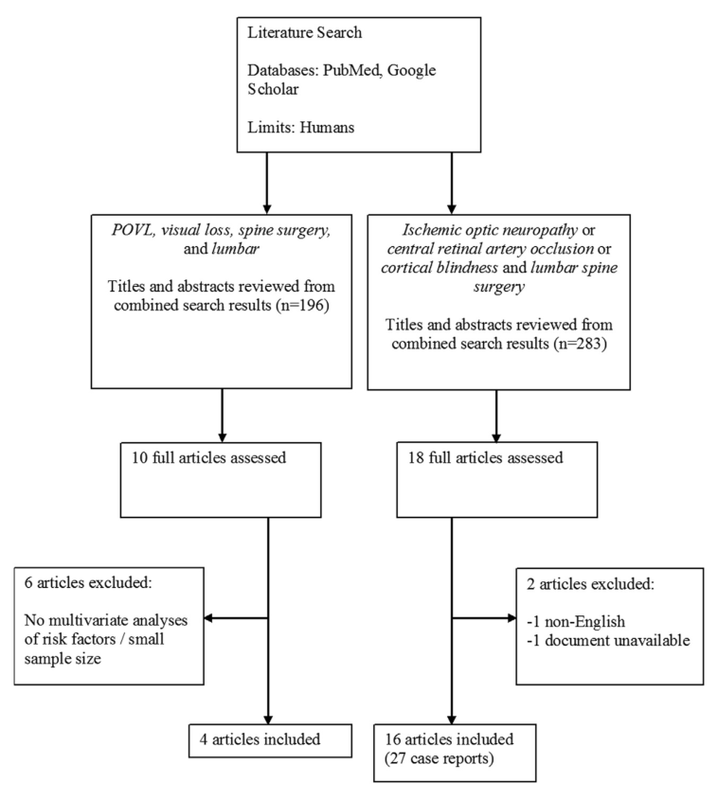 Relevant articles on POVL after spine surgery were identified and reviewed according to Preferred Reporting Items for Systematic Reviews and Meta-Analyses guidelines. We identified 4 large-scale studies that statistically analyzed risk factors for POVL. ION, CRAO, and CB were the most frequently reported POVL types in the literature. Data were abstracted from 19 ION case reports, 3 CRAO case reports, and 5 CB case reports. We reviewed the preoperative and intraoperative risk factors for each of the 3 main POVL types, using several published case reports to supplement the limited large-scale studies available. ION risks may be influenced by a longer operative time in the prone position with anemia, hypotension, and blood transfusion. The risk for CRAO is usually due to improper positioning during the surgery. Prone positioning and obesity were found to be most commonly associated with CB development. The prognosis, prevention techniques, and treatment of each POVL type can vary considerably.